has been practised since the 17th. Century. It fell out of favour for some time, BUT since the late 1990's is back in style. These days there are many types of ribbon to choose from, with a wide variety in colours, textures and widths. Silk is the most suitable because of it's soft texture and shapes well, but other types can be effective in different situations. One of the options you have is Cascade House Silken Ribbon ( 4 mm. only ) made from cow's milk. stitches like silk at a slightly lower cost. When you are first learning this technique, use a fabric with a weave that will allow the needle and ribbon to pull through easily. I find for my beginners that a linen is the best to use, the threads move aside well and still looks effective. On a more advanced project you cannot beat Dupion Silk. the threads pull in some fabrics. 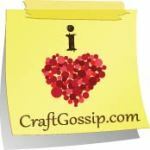 scrapbooking pages, ceramic tiles, in a piece of fabric, or on a greetings card. Crazy Patch / Quilting is a blank palette just waiting for the addition of S R E.
a beautiful way of creating your own style and design. school days with a sampler. You can go wild with colour and choices. For inspiration visit some of the chosen sites on the side bar of my blog. but ribbon embroidery can also be applied here. The embellishments that you are purchasing can be handmade with so many more options just from scraps you may have in your kitty. Five Petal Flower is one such flower. the size of the chenille needle to suit. out ring to assist with the needle placements. Place the needle in the centre of the ribbon, at the length that you require your petal to be. Pull the needle through slowly, I place my left ring finger on the ribbon at this time. the length of ribbon twisting. fingernail for shaping as you pull the ribbon through. ribbon to the right and away from the worked petal. 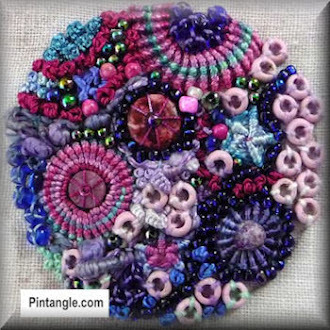 Continue around the full circle, placing a bead or french knots in the centre. and bee in Silk Ribbon. as you are pulling it through. ( Also prevents you from pulling too tight ). through and pull it to the right ( go gently until you get the required tip ). Pulling the ribbon to the side or downwards a little will give it a small curl or place the needle through to one side of the ribbon will create a folded ribbon stitch. Enjoy your time working with Silk Ribbon, but remember you are imitating nature, and even nature has imperfections in its work. Please take a few minutes to read these few hints, before starting your first project. Hopefully it will make your first effort trouble free. 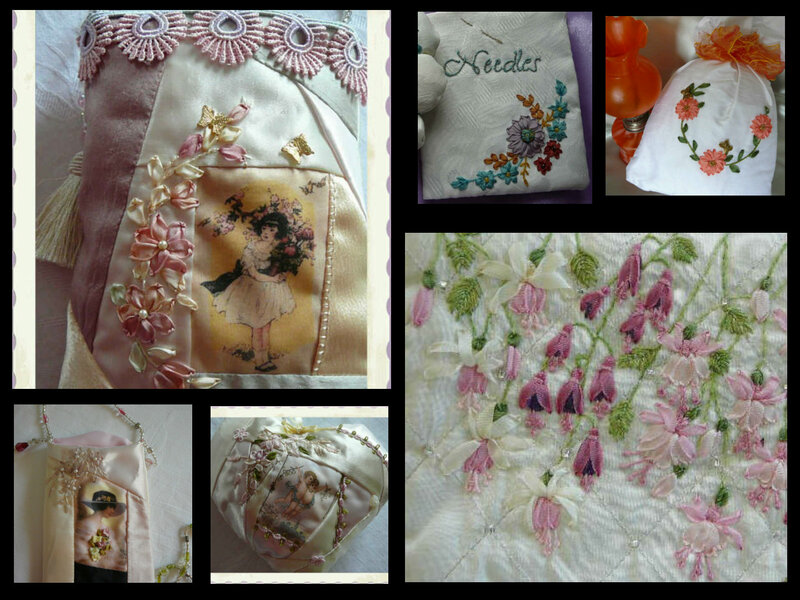 You will need a Chenille Needle for Ribbon Embroidery which has a sharp point and a long eye. They come in sizes 18 - 22 and can be purchased in a mixed pack. size 22 for 4 mm and under. an opening in the fabric. fabric and you will notice that the latter stitches will not be of the same quality as the first ones. the ribbon through the eye of the needle. to stitch your ribbon ends and a softer surface to work with. this can be unthreaded or loosened off. Pull cut end through and tighten ribbon length until it is firm. Option 2 - Has shorter tail, but you may need to cut the ribbon if the needle gets caught up. Thread the ribbon through the eye of the needle, leaving a tail. Then take it up to the needle and tighten the other end. Colourfast, but at times there can be just 1 length that is not. first time it is washed. not to have knots or creases. Silk Ribbons should be stored away from direct light with no sharp creases. to smooth and straighten it out. I hope this is of some help to beginners and maybe a refresher for those who have been away from Ribbon Embroidery for awhile. Remember these are my hints, coming from my experience spent with this craft. I can only give you a guide, but with practice you will develop your own methods. For those of you who have used this stitch before will know how EASY and VERSATILE this stitch can be. 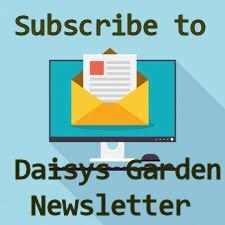 When working Lazy Daisy Stitch in ribbon it is known as Detached Chain. Loop the thread around the needle and pull it through. You now have a link, forming your first petal. Take the needle through to the back, just below the loop. This anchors the petal down. For the next step come back up close to the first and repeat. Continue in this manner till you have a full circle and completed flower. The thread is brought through from the back of the material and re-inserted as close to this point as possible ( ithout catching the needle through the thread ). The length of the petal is determined by the distance the needle is taken through. needle and pull it through. Take the needle through to the back, just below the loop. This anchors the petal down. For the next step come back up close to the first and repeat. Detached Chain Stitch is done in much the same way. It is best if you only use between 2 and 4 mm ribbons in this stitch. The wider ones are not suitable to shape the petals. The material may be held in an Embroidery Hoop or free in the hand. If using a hoop the stitching will be in stabbing up and down manner. It is too difficult to take the needle across. Your fingers will soon testify to this. When using the ribbon I personally prefer the ribbon to be flattened out and smooth. through and straighten out the ribbon. and you will have more control over the shaping of the petal. The flowers I worked on this carry bag are all Lazy Daisy Stitch with a few french knots added for the centres and base.The different effects are obtained by changing the size, colour and directions. 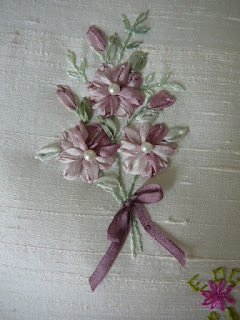 Ribbon is used to make up this Flower Spray in Detached Chain, and the buds and leaves are done in the same stitch. Just look what you can do with Hand Dyed Ribbon. leg hem of a pair of jeans and beads added as you go. of Sage Green 4 mm Silk Ribbon on the tips. Capital ( Beef Expo 2009 ) has just finished last month. creating and selling my work, but now it is about encouraging others to take up this easy, quick form of embroidery. starting to realise how therapeutic craft can be. Why not become one of them.